Historians can’t pinpoint the exact time when the Pyramid debuted, but men have been marveling at its artistry for ages. The basic shape starts with a wide base at the lip and tapers up to a near point under the nose. When done right, the Pyramid can make you feel like a king. Shave or closely trim your cheeks, chin, and neck, while leaving the mustache untouched. 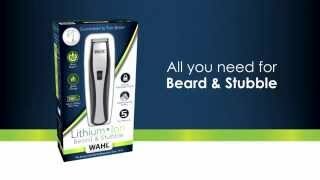 Use your Wahl® trimmer to cut the mustache whiskers to about a quarter-inch in length. With the trimmer, create a sloped border that starts below the middle of your nose and extends to the corner of your mouth. If feeling particularly adventurous and skilled, you can create a more curved design. Repeat the last step on the other side of the mustache. Make sure both sides are even and equally sloped. Each side should be a mirror image of the other. Trim the lower edge of the mustache to prevent whiskers from crossing the lip line.